Vendors & more on Saturday, May 4! Beautifully rustic & each one unique, these live-edge picnic tables and garden benches are built with white pine harvested from HVNC's Sustainable Forestry Demonstration woodlands. *Benches and tables may be picked up at the Sale or at Midcoast Conservancy office on Rt 1 in Edgecomb. Native bee houses, bird houses, bat houses, plant markers - and Gardener's Goat Milk Soap. Wood products are constructed with repurposed materials by Bill Rudy and soaps are handmade by Cheryl. tea kettle, beer can (! ), cookie tin, flour tin...or a combination. New this year, Guini Ridge Farm will be on hand with annual vegetable and flower seedlings, compost, potting soil and other amendments, as well ascoupons for warmer weather seedlings redeemable at their greenhouses on Rt 1 in Rockport. Every year, Pete Beckford brings a sampling of perennials and herbs for cash & carry - some of which are not available in enough quantity for pre-order. Looking for something you didn't see in the catlaog? Pete just might bring it to the sale! Back for a third year, Sharon Turner offers a selection of cash & carry trees and shrubs not in the catalog as well as larger sizes of some that are - and a few surprises! Jean Vose and Pete Lammert will be back for year number (?) with an observation hive and lots of info on bees, beekeeping, and how you can become a beekeeper. 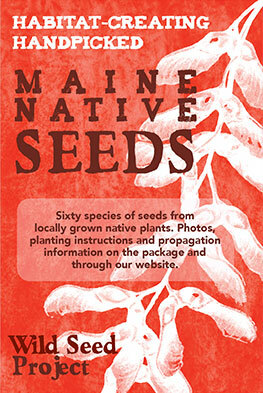 Wild Seed Project will be on hand with copies of the fabulous Wild Seed Annual Magazine for sale. Cheryl Denz of Terra Optima Farm will be in the Fruit Tree stalls on Saturday to help you figure out which varieties are the best for you and your site - and how to plant and prune your new trees! Additional exhibits - as well as plant care fact sheets - will be set up in the "restaurant" building at the end of the midway, directly across from the sale. Questions? Call Hildy at 596-2040 or info@knox-lincoln.org.